In August 2007, while working as a Natural Environment technician at Te Papa, I was asked if I would like to help build whales. To be more accurate – rebuild them. 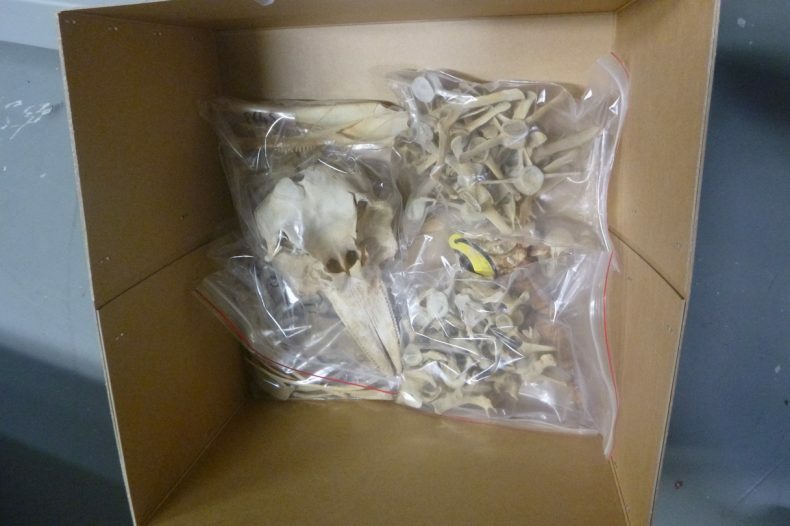 I was to assist Mike Huaki, who had been given the job of articulating all the cetacean skeletons for the upcoming Whales | Tohorā exhibition that was due to open at Te Papa in December 2007. Mike had already assembled a Gray’s beaked whale, an adult female sperm whale, and was partway through a bull sperm whale and a pygmy right whale. 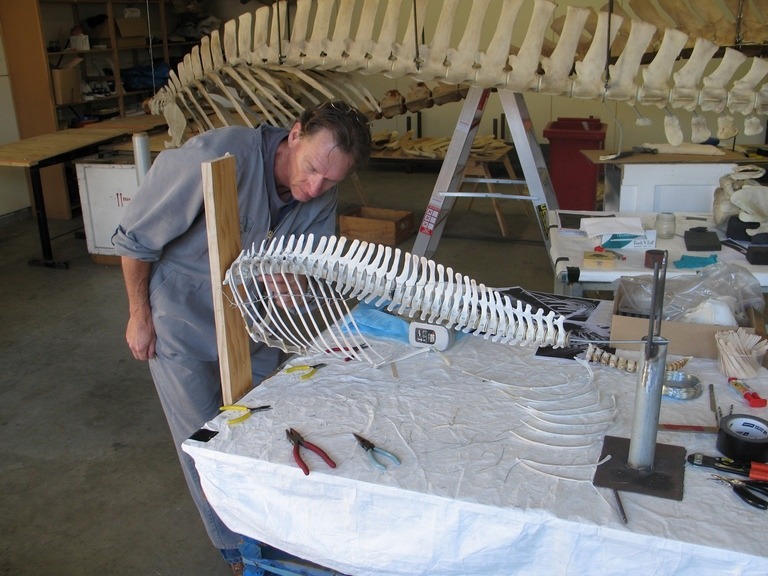 One of my first memories of that period is walking into the workshop and seeing a bizarre-looking half-assembled whale skeleton that appeared to be trapped in a spider web of string and rope that Mike was busily weaving around it. This was his solution to get the 36 overlapping ribs held temporarily in position so he could design and build the steel armatures to support each one in its correct position. After a few weeks of lifting and holding sperm whale vertebrae, ribs, and massive jaws in position while the serious engineering was carried out, I was trusted to take on a somewhat more modest project on my own. I was handed a relatively small box and told to “build a Hector’s dolphin”. As this rare endemic cetacean is the world’s smallest dolphin this was a job on a more manageable scale for someone that wasn’t an engineer. Instead of welded steel armatures and pipes, most of the bones could be held together with stainless steel wires and adhesive. The small size did present a few problems, mainly the risk of damaging some of the very delicate bones such as the ribs while attaching them to the vertebrae. There was also the nerve-wracking job of individually gluing each of the 106 teeth (each about the size of a grain of rice) into the jaws and holding them in the correct position until the adhesive set. The final product has spent the last 10 years touring North America with Whales | Tohorā, travelling thousands of kilometres between 16 venues without so much as a cracked rib. 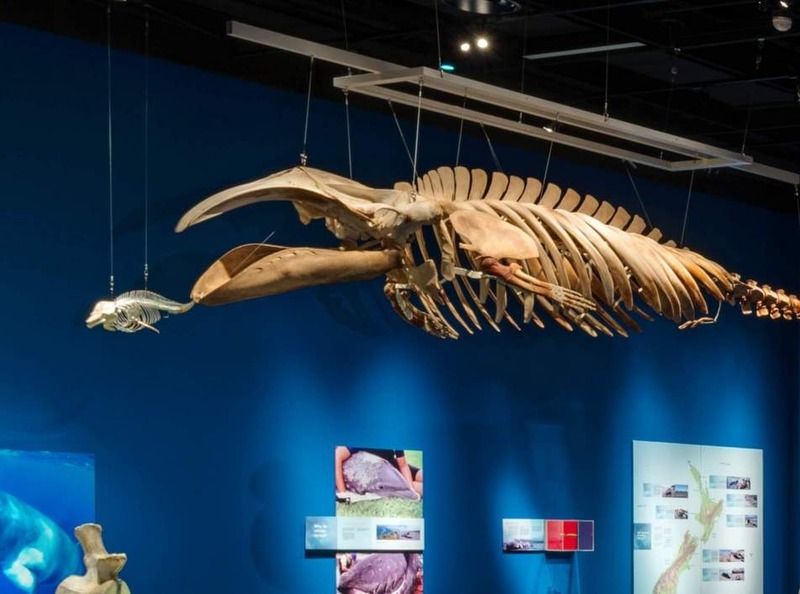 The Hector’s dolphin may not be as monumental as some of the larger whale skeletons but if you get a chance to see the exhibition keep an eye out for it – it is small but perfectly proportioned. Are we going to be able to see this exhibition here in Wellington some time soon? There is no confirmed date for the exhibition’s return to New Zealand. It will be travelling from Canada to Australia at the end of this year so it is getting closer. Hey: whats da problem? Don’t ya know da head bone’s connected to the neck bone, an da neck bone’s connected to da back bone, and da back bone’s connected to da thigh bone … just follow what da Lord says man …. easy as, Bro.